An ambulance driver has denied killing a mobility scooter user in a crash by driving dangerously. 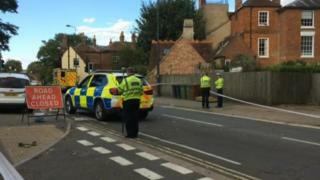 The vehicles collided in Stratton Way, Abingdon, Oxfordshire, on 10 August. Adrian Hesford, 64, was knocked from his scooter and later died from his injuries. Angus McCullock, 23, pleaded not guilty to causing death by dangerous driving when he appeared at Oxford Crown Court. He was granted bail and told he would face trial on 18 November.